Height: 53.3 meters (about 175 feet). Location: Center of Harbin in Heilongjiang Province. St.Sofia Orthodox Church is the largest Orthodox Church building in the Far East. It was built early in the 20th century, for the Russians and other Orthodox people living around Harbin. View Jewish Heritage in China. It is 53.3 meters (175 feet) tall, and it occupies an area of 721 square meters (0.18 acres). The style of the building is Neo-Byzantine. The main structure is laid out in the shape of a cross with the main hall topped with a huge green tipped dome. There are smaller steeples, and the domes and steeples are topped with gold colored crosses. It looks like the church building at the Red Square in Moscow. It is beautiful to look at, and the interior is beautifully designed and decorated. It is one of Harbin’s most magnificent buildings. The church building sits on a plaza. It has red walls with a green dome and steeples that are topped with golden crosses. To non-Russians, it is a highly unusual looking building. Though the building’s interior was damaged after the revolution, it is still beautiful. There are icons (religious pictures) hanging on the walls and a big chandelier. The lighting used inside the building that combines with the light coming in from the windows and the light colors used inside such as gold and green and bright red is really beautiful. It gives a warm and cozy feeling. Harbin itself doesn’t have a long history as a city unlike most other Chinese cities. The Japanese defeated the Russians during a war in 1905, and the Russian No. 4 Army Division arrived in the region. A wooden building called St. Sophia Church was built at the site, and it was finished in 1907. Then construction on the existing structure began in 1923 for the Orthodox of the region, and it was finished 9 years later. It is a work of art. The immediate area has other highlights for architecture fans, skiers, and animal lovers, and there is a large amusement park. 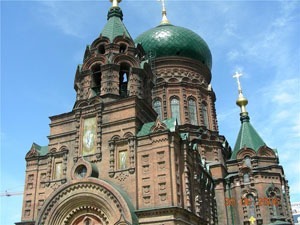 The Harbin area has other buildings and churches from the era when it was an international city around Central Street. 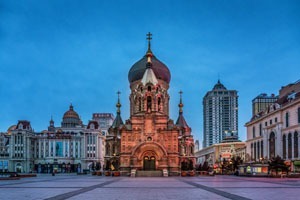 St. Sophia Cathedral is on the corner of Toulin Street (Toulin Jie) and Zhaolin Street (Zhaolin Jie) in the central Daoli district of Harbin. You can get to Harbin by train or plane. The airport is about 30 kilometers or 19 miles from the church building, and a taxi ride takes about 45 minutes or an hour. The flight between Beijing and Harbin takes less than two hours. Most of the trains between Beijing and Harbin are overnight trains that leave in the afternoon and arrive early the next morning. You can take bus No. 101 from the railway terminal to the cathedral. The museum is open from about 9 am to 6 pm.